Pastor Jeffress was plucked from the crowd today and asked to go on stage at the Trump Fort Worth rally. 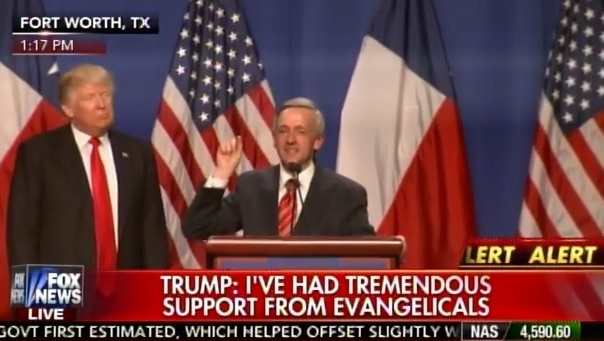 Pastor Jeffress gave Trump an amazing endorsement. Jeffress called on ALL EVANGELICALS to endorse Donald Trump. Let me just say briefly I know three things about Donald Trump. Number One: He Sincerely loves this country. He has 10 billion reasons he doesn’t have to do this. But he sincerely wants to make America great again! Number Two: He is pro-Life. I have talked with him in Trump Towers. He wants to protect the unborn… I tell you what, some of you who say, “Well I don’t know.” His pro-Life conversion was real. Let me tell you something. Hillary Clinton doesn’t claim any pro-Life conversion. If you go for Hillary Clinton or Bernie Sanders there is no doubt you are going to have the most pro-abortion president in history. Here is what I finally know about Donald Trump. Donald Trump cares about and loves evangelical Christians… I have met with Mr. Trump on several occasions and I can tell you from personal experience that if Donald Trump is elected president of the United States we who are evangelical Christians are going to have a TRUE FRIEND in the White House. God Bless, Donald Trump.